Let's say you closely follow Investor Juan's "6 Step Guide for Newbie Investors" and have painstakingly worked your way to step six: you've erased your debt, built up a solid emergency fund, invested in UITFs, set aside a regular portion of your income for investment, managed a well-diversified portfolio, and now feel mentally and financially prepared to invest in individual stocks. But then you realize that apart from the general information about stock investing that you learned from this blog, you don't know enough specifics to actually start investing. Throughout this post, we will use Jollibee as an example to describe the above topics. 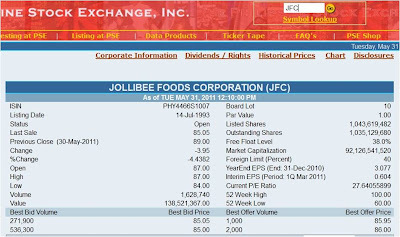 Below is a screenshot of Jollibee's information page on the PSE website. 1. Ticker or stock symbols are unique identifiers for the securities traded in the market. 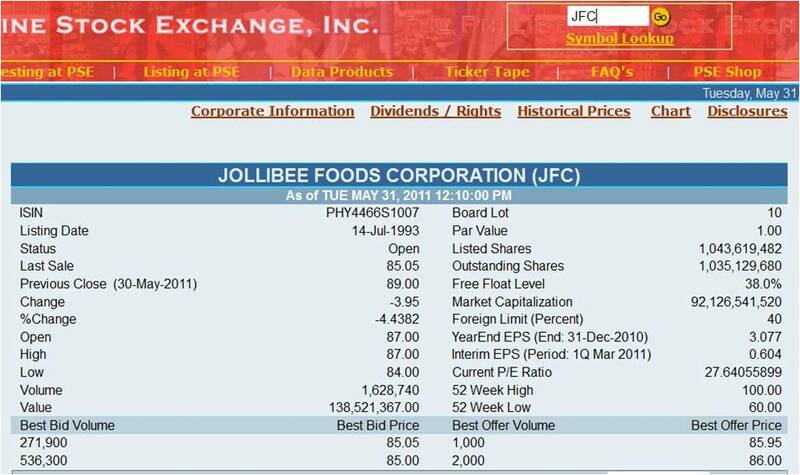 Jollibee's ticker symbol is "JFC," which of course stands for Jollibee Foods Corporation. Knowing the ticker symbol of the stock that you want to trade allows you to retrieve information about the stock (by typing the ticker symbol on the "Symbol Lookup" box on the upper right corner of the PSE website's main page and clicking "Go") and, most importantly, to actually buy and sell the stock. 2. A board lot is a standard number of shares that a particular stock should be traded in, based on the stock's price and a schedule defined by the Philippine Stock Exchange. The purpose of board lots is to facilitate more convenient trading by making it easier to match the number of shares of a stock demanded by buyers to the number supplied by sellers. Based on the board lot table on the PSE website, JFC at its current price range may only be bought or sold in multiples of 100 shares. 3. The bid price is the price that a buyer is willing to pay for a security. At the moment the screencap below was taken, the highest price ("Best Bid Price") for which investors are willing to buy JFC are 88 and 87 pesos. The bid price basically tells you how much you'll get if you sell shares of the stock. 4. The offer or ask price is the price a seller is willing to sell the shares for, so it's the number you'll want to look at if you want to buy shares of the stock. As you can see in the image below, the ask price is higher than the bid price, as it should be since buyers always try to buy shares at the lowest price possible and sellers always try to sell shares at the highest possible price (imagine what would happen if it were the other way around). The difference between the bid price and the ask price is called the bid-ask spread. 5. And the last, and perhaps most important, thing that you need know is when the market is open for trading. The PSE's trading hours are from Monday to Friday (except on legal or special holidays), 9:30 AM to 12:10 PM. Now that you know the above information, I think you're now pretty much ready to buy your first stock. In my opinion, the most convenient way to invest in stocks is through online brokers. I've tried BPI Trade, and I also heard good feedback about Citisec Online. There are other alternatives, subsidiaries of large Philippine banks, like First Metro Securities and RCBC Securities. As far as I know, RCBC charges the lowest commission at 0.25% compared to the 0.30% charged by other platforms. Wishing you the best in your investments! Renzie is a CPA who is currently working for a brokerage firm in the Philippines. He is not in any way connected to the online brokerages mentioned in this post.